Total Quality Management (TQM) refers to management methods used to enhance quality and productivity in business organizations. TQM is a comprehensive management approach that works horizontally across an organization, involving all departments and employees and extending backward and forward to include both suppliers and clients/customers. 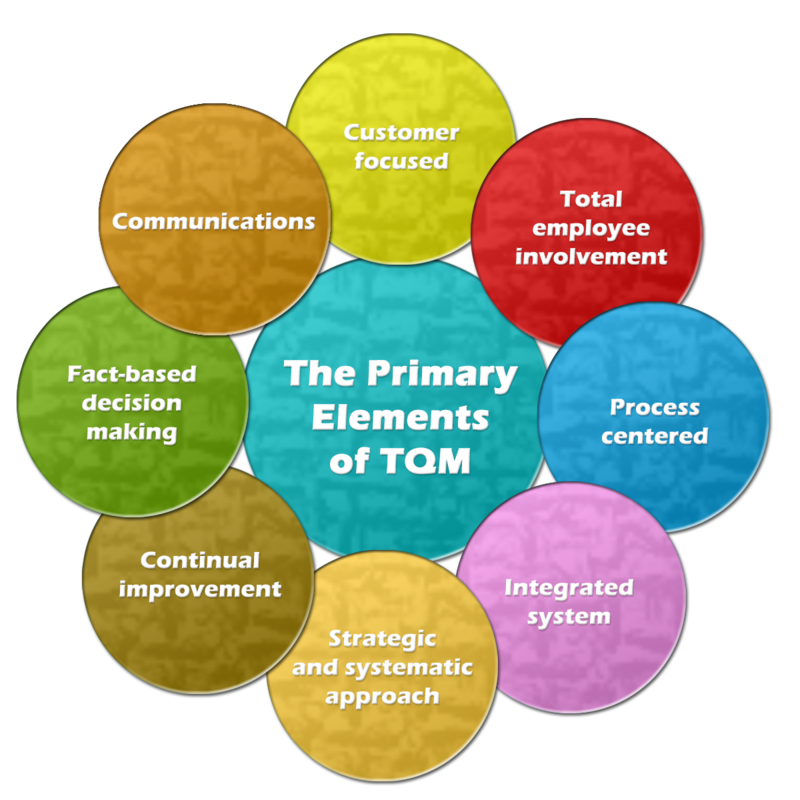 TQM is only one of many acronyms used to label management systems that focus on quality. Other acronyms include CQI (continuous quality improvement), SQC (statistical quality control), QFD (quality function deployment), QIDW (quality in daily work), TQC (total quality control), etc. Like many of these other systems, TQM provides a framework for implementing effective quality and productivity initiatives that can increase the profitability and competitiveness of organizations. Customer-focused. The customer ultimately determines the level of quality. No matter what an organization does to foster quality improvement—training employees, integrating quality into the design process, upgrading computers or software, or buying new measuring tools—the customer determines whether the efforts were worthwhile. Total employee involvement. All employees participate in working toward common goals. Total employee commitment can only be obtained after fear has been driven from the workplace, when empowerment has occurred, and management has provided the proper environment. High-performance work systems integrate continuous improvement efforts with normal business operations. Self-managed work teams are one form of empowerment. Process-centered. A fundamental part of TQM is a focus on process thinking. A process is a series of steps that take inputs from suppliers (internal or external) and transforms them into outputs that are delivered to customers (again, either internal or external). The steps required to carry out the process are defined, and performance measures are continuously monitored in order to detect unexpected variation. Integrated system. Although an organization may consist of many different functional specialties often organized into vertically structured departments, it is the horizontal processes interconnecting these functions that are the focus of TQM. Micro-processes add up to larger processes, and all processes aggregate into the business processes required for defining and implementing strategy. Everyone must understand the vision, mission, and guiding principles as well as the quality policies, objectives, and critical processes of the organization. Business performance must be monitored and communicated continuously. An integrated business system may be modeled after the Baldrige National Quality Program criteria and/or incorporate the ISO 9000 standards. Every organization has a unique work culture, and it is virtually impossible to achieve excellence in its products and services unless a good quality culture has been fostered. Thus, an integrated system connects business improvement elements in an attempt to continually improve and exceed the expectations of customers, employees, and other stakeholders. Strategic and systematic approach. A critical part of the management of quality is the strategic and systematic approach to achieving an organization’s vision, mission, and goals. This process, called strategic planning or strategic management, includes the formulation of a strategic plan that integrates quality as a core component. Continual improvement. A major thrust of TQM is continual process improvement. Continual improvement drives an organization to be both analytical and creative in finding ways to become more competitive and more effective at meeting stakeholder expectations. Fact-based decision making. In order to know how well an organization is performing, data on performance measures are necessary. TQM requires that an organization continually collect and analyze data in order to improve decision making accuracy, achieve consensus, and allow prediction based on past history. Communications. During times of organizational change, as well as part of day-to-day operation, effective communications plays a large part in maintaining morale and in motivating employees at all levels. Communications involve strategies, method, and timeliness. These elements are considered so essential to TQM that many organizations define them, in some format, as a set of core values and principles on which the organization is to operate.